Along the prow of the Santa Monica Mountains above the West Valley, Calabasas is immune from neither the flatlands’ triple-digit heat nor the burden of an 818 area code. What sets it apart is thousands of open-space acres, as well as a TMZ-ready roster of residents, from YouTubers to sports legends. Shop: The Commons at Calabasas, Rick Caruso’s center of mall-Med architecture complete with Rolex clock tower, burbling koi-filled ponds, and exuberant bronzes, just preceded the Grove. A de facto town square, it’s a good bet for celebrity spotting. 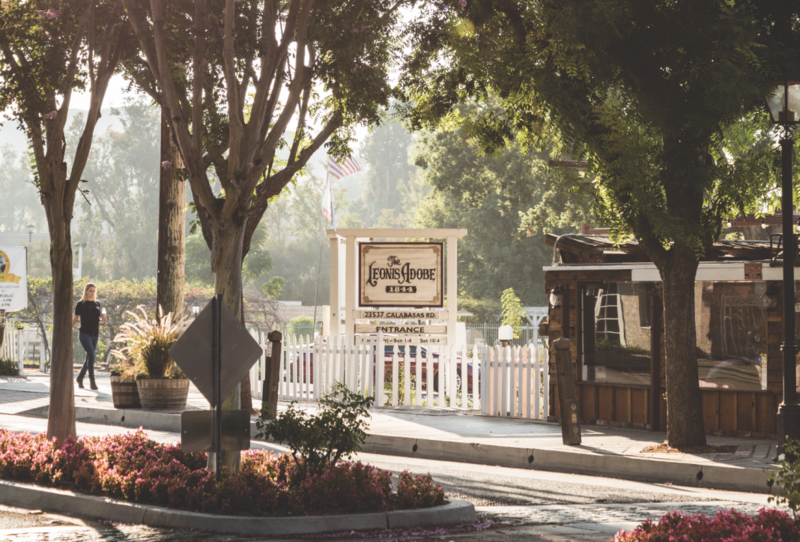 Cycle: Mixing a cycling theme with reclaimed wood, Old Town Calabasas’s Pedalers Fork features a menu inspired by the Saturday morning market just outside its doors. It’s close to French, a clothing boutique, epicurean emporium, and home decor shop all in one. Taste: Even after the arrival of Sugarfish by Sushi Nozawa, Shibuya remains Calabasas’s sushi hang of choice and is worth the wait. It’s in the same strip center as Blue Table, a tiny gourmet shop where you can score a prosciutto and burrata panini. Tour: In the 1870s the Basque sheep rancher Miguel Leonis built a graceful two-story Monterey-style home, now known as the Leonis Adobe. The Old Town property is open for tours and, with its longhorn cattle and Percheron horses, should keep the kids entertained. Inner Peace: It may resemble a movie set, but the ornate Malibu Hindu Temple is an authentic sanctuary crafted by artisans from India. Take of your shoes, stop and smell the incense, and gaze upon the intricate carvings that adorn the tapering towers. Game Time: With a meat-centric menu, from elk to emu, and a rustic interior of stone, antlers, and roughhewn logs, Saddle Peak Lodge recalls wilder times in these parts. Crown Jewel: Wallace Neff designed the mansion at King Gillette Ranch, the razor magnate’s 1920s estate. Stroll the grounds or hike to the ridge for views of Goat Buttes in Malibu Creek State Park and the sandstone outcrops on Saddle Peak. City of Stars: Before A-listers chilled at the Commons, they worked at 20th Century Fox’s movie ranch, now Malibu Creek State Park. The farmhouse from the Cary Grant film Mr. Blandings Builds His Dream House serves as an office, while a five-mile round-trip hike leads to the old M.A.S.H. location.